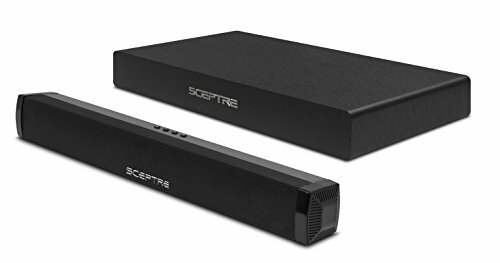 With a 2.1 sound channel and a built-in subwoofer, the Sceptre SB80-PS Power Sound Bar pairs serene treble and roaring bass all in one compact design. Simplicity is the underlying theme of this device, as Bluetooth connection and a lightweight remote are readily available. 3.5 Stereo, Coaxial Digital, Optical Digital, and a subwoofer input are built into the SB80-PS to deliver maximum connectivity. Length: The 20" Power Soundbar produces clear and robust sound from a sleek and compact body to enhance your audio experience. Subwoofer: The unique design of the down-firing subwoofer is an advancement from traditional bulky and tall subwoofers. Engineered to be compact in design without compromising the integrity of powerful, deep bass. Connectivity: Built with more than one way of connection (3.5mm stereo jack, SPDIF (coax) digital audio, and L/R RCA jacks). Bluetooth: Built-in Bluetooth supports A2DP (Advanced Audio Distribution Profile) and EDR (Enhance Data Rate) Technology. If you have any questions about this product by Sceptre, contact us by completing and submitting the form below. If you are looking for a specif part number, please include it with your message.